Sadness: Legendary phone phreak Bill Acker has passed away. Audio: Phil discusses Joybubbles, the famous blind whistling phone phreak, on NPR's award-winning show RadioLab. Video: Watch Phone Phreak Confidential, Phil's talk at this year's Hackers on Planet Earth conference. Blog, Twitter, and Facebook: Check out my blog, follow me on Twitter, like me on Facebook or subscribe to my low-volume email announcements list. Exploding The Phone is their story. The Telepone Museum needs your help! By April 2018 they need to raise the final $15,000 of the $50,000 required to restore the exterior walls of the main museum building that protects their rare switching equipment. They are close to meeting their goal, so your contribution will make a difference! To donate, click here. 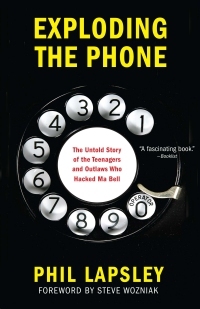 Author Phil Lapsley traces the birth of the telephone, the rise of AT&T's monopoly, the discovery of Ma Bell's Achilles heel, and follows the kids and outlaws who used it for fun and profit. Along the way you'll meet an oddball cast of characters ranging from FBI agents to whistling blind kids, from informants to entrepreneurs. In the words of one reviewer, "At turns a technological love story, a counter cultural history and a generation-spanning epic, Exploding the Phone is obsessively researched and told with wit and clarity. It captures a moment in time that might otherwise have been lost forever."